The Battle of Waterloo V - 5K/10K Trail Run, 9 A.M. 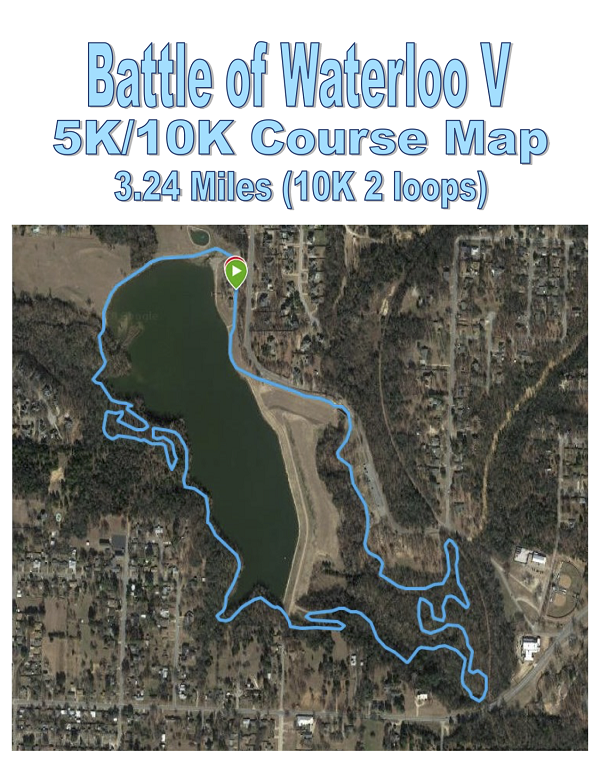 The "The Battle of Waterloo IV - 5K/10K Trail Run" will be run on the scenic trails of Waterloo Lake Regional Park in Denison. The terrain of the trail varies form wide to narrow, there are some moderate climbs and descents, and many natural obstacles. 10K participants will complete 2 loops of the course. Runners and walkers are welcome. The event is chip-timed by C2C Race Timing and results can be found at dfwraces.com/results, www.chip2chipracetiming.com and C2C's Facebook Page. The race will take place, rain or shine. In the event of extreme circumstances and the event has to be canceled there will be NO refunds given. Overall M & F in the 5K & 10K will receive a Unique Award. 10K Awards - Top 5 M & F finishers in the 10K includes Overall. Sign up early or by 5/02 to be guaranteed a t-shirt. T-Shirts will be available on race day on a first-come, first-serve, basis and may not be available in all sizes or at all. Please register early! A portion of the proceeds will benefit the Denison Meals on Wheels Program. Please come help out! When this page loaded, the official time was 8:28:54 AM EDT.